Please forgive me for not writing you sooner regarding my trip to Kenya through your organization. As I told you before this was my third trip, but I must say was the best. The two host family's one in Nairobi and Maasailand were exceptional, although I particularly love the one in Maasailand as they just couldn't do enough for us. The husband and wife (Paul & Penina) were both school teachers, he was the school master, and we were able to embark information to the children. Rosemary (Reg. Nurse) discuss ways to stay healthy and we both did a seminar on Sexuality and Aids. The children were very pleased to see us, and very kind and appreciative, believe you I think that our children in America could learn a lot from them, I was surprise of their behavior even when the teacher was not there during the session they still was very well behaved. To you guys, you should try to push for more volunteers to Maasailand as there is so much work to be done there and the amazing thing you get three cooked meals a day, which does not happen in Nairobi, I guess because of the cities lifestyle. Yes, I would definitely go back to Maasailand, Did I forget to mention that Virginia our gracious host in Maasailand and her crew were also exceptional. It was our last day there and we met some new volunteers and was quite impressed at the orientation that was given to them welcoming them to the region and what to and not expect, respecting their traditions and ways to stay safe. We told them about our experience, I was deeply moved by the desire of these young people wanting to serve not only there but in Nairobi as well. Well I guess that's all for now, I told a friend of mine about my experience, she is in Nairobi now, I told her if she has time please go to Maasailand and speak to Virginia, My friend is a school teacher and a minister and might be able to help tremendously in this region. I will definitely tell many about my experience, and as you know I have been involved also in sending people to Africa, as I mention to you a gentleman from my church went to Uganda for one whole month to build two wells in the region. Someone else in my church approached me and asked if he could discuss going to Africa to do work there. Yes, we are older people, I guess you would call us "Seniors", but we are capable,flexible and eager to make a difference. Thank you, thank you so much for this wonderful experience. Good luck as you continue to make others happy, also Deborah thank you for being easy to talk to, and having the friendly approach, it seemed that we knew you for a long time. 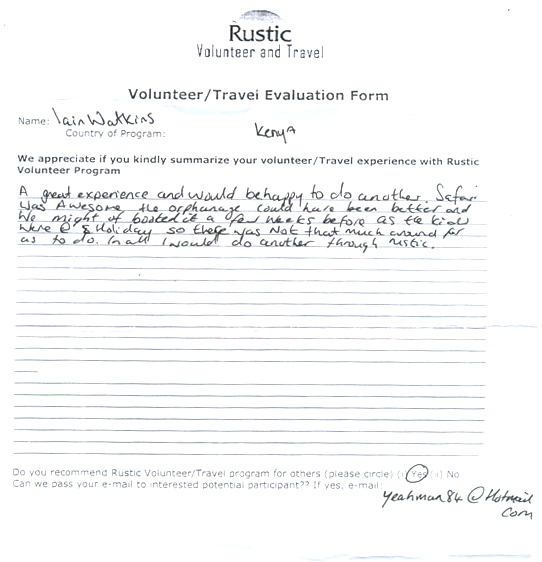 Volunteering with Rustic Volunteer was an outstanding and rewarding experience. I enjoyed volunteering at my placement at Wakibe Community Project very much in which I contributed my skills in all sorts of activities (soccer, feeding, planning future land and member extension) whether it involved the kids or adults who were members of the HIV/AIDS project. The staff was very friendly as well as my host family that Rustic Volunteer Program sent me to. 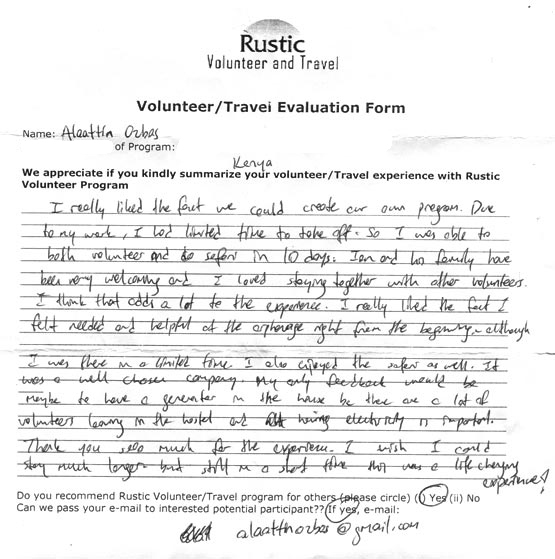 They helped me settle in and get accommodated to different ways of life which I never would I have seen if I had not found out about Rustic! Surprisingly, it took only one day to get used to the public transportation, the matatus, and it was fairly simple to find my way around the fun city of Nairobi where I visited various Masai markets and other tourist attractions. 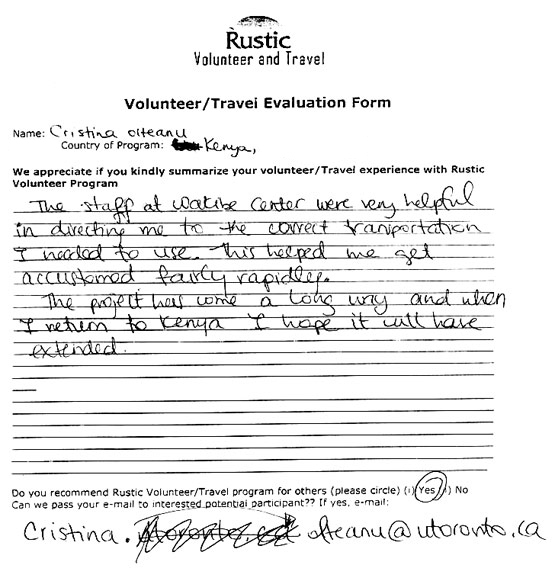 Rustic Volunteer Program took great care of me; I was definitely safe in their hands. 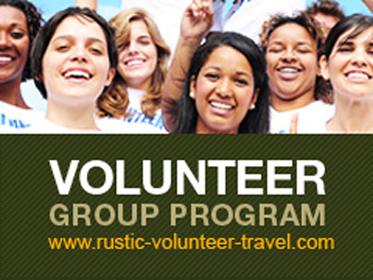 I highly recommend Rustic Volunteer Program to anyone who has an open mind and wants to see the world in a different light with the passion of helping others. The amount I learned and the things I saw were priceless; I can't wait to go to Africa again one day! 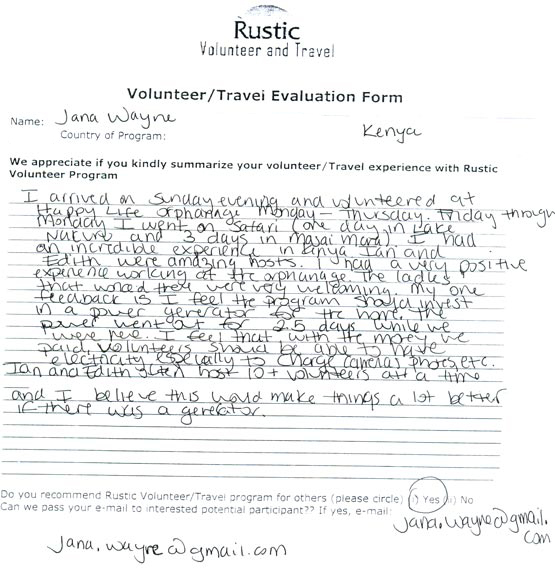 When we first contacted Rustic, Deborah Ascuncion was very understanding and accommodating with our schedule (unlike the other volunteer programs we inquired about). 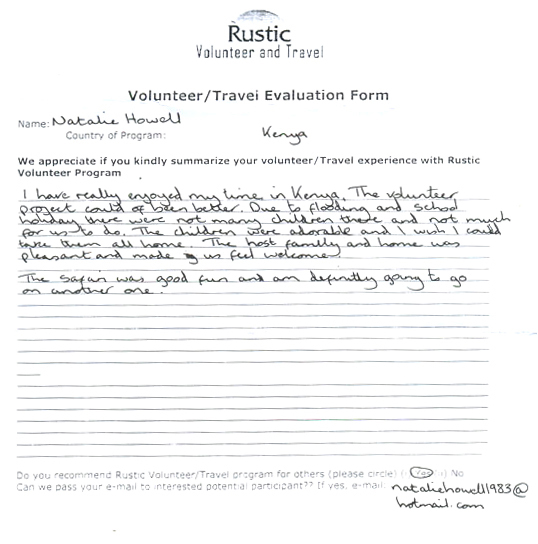 She was always quick to respond to our questions and was the reason why we chose Rustic :) When we arrived at our accommodation, we were greeted by about 15 other volunteers from around the world (who all lived under the same roof) and our host family (who actually lived next door). The volunteers were very nice and helpful, and helped us get to our volunteer programs and told us about the different things to do and places to eat around the area. The downfall about having several volunteers live under the same roof, coming in and out at different times(e.g. the 16 year old students who would come home at 4am after a night of partying), and volunteering for different lengths of time (some volunteers stayed for 1 week, some for several weeks/months), made the accommodation not so clean. Volunteers (present and past) would leave their stuff (toiletries, shampoo bottles, toothbrushes, clothes, etc...) in the bathrooms and around the house. It was obvious that the toiletries were there for a while, but it made it difficult for the sweet host family (who did their best to keep the house clean for everyone) to keep track of people's stuff because they wouldn't know if owner of the belonging was still volunteering and living at the home still. As for the location, being right next to the beach was definitely a plus! Our volunteer experience was amazing! We had a great time working with the children at the special school (children with various special needs) and the children at the orphanage. Everyone was very welcoming and very nice. Thank you for an amazing opportunity of a lifetime! Country of Program: Kenya Miniquest, Jan. 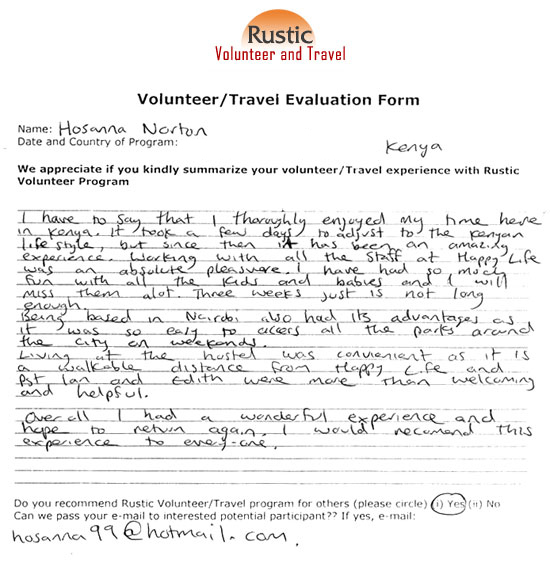 I thoroughly enjoyed my volunteer travel experience with the Rustic Volunteer Program in Kenya! Mrs. Beatrice Waweru, my country Coordinator, was very kind and helpful to me. She became a friend and mentor, and I consider her and her family part of my new African family now! While in Nairobi, I was able to visit and help at the St. Dorcus Education Center, where I met lovely and kind Jacinta Thaimuta, their Director and her family. My last day visiting there, I was able to show children of all ages how to bat a ball, using two red plastic bats and some balls I brought with me from home. It was SUCH FUN for all of us, and my taxi driver, Joseph, helped and played too ! I also purchased very beautiful leather hot plate holders and key chains and stationery the children made for myself and to give as gifts for family and friends back home. Wonderful work is being done by and for the children at St. Dorcus, and I encourage anyone who visits the area to go there and see it for yourself. The children also drum and dance, which I was able to video tape while there. The children enjoyed looking at the video afterwards! As part of my Kenya sightseeing, I was able to visit the orphan elephants and feed giraffes in Nairobi, and Beatrice arranged an amazing safari for me, which I will never forget! I also was able to spend a week in Gedi, near Watamu, Kenya, and stayed in Beatrice's host home on the Indian Ocean during my Miniquest. While there, I volunteered at Rainbow House, an orphanage in Gedi. Working with the young children and staff there was very rewarding! The children are learning English quickly and well, so they can grow up to lead happy, fulfilling lives. 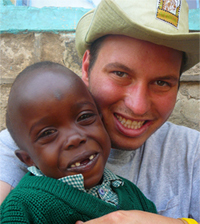 my Kenyan Miniquest was an amazing, life-changing adventure for me, and, "Nitarudi tena!!" (I'll be back again! ), God willing. It was the best experience of my life!! I had such a good time there, the kids were amazing and i met some people i will always stay in contact with!! Thank you for a wonderful experience and i believe i will be doing it again soon! !